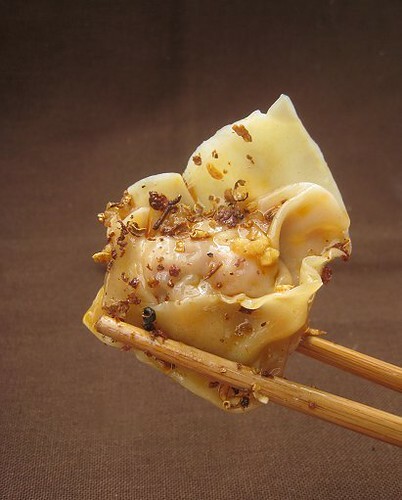 I had some leftover wonton wrappers from our Smoked Salmon Rangoon escapades, so I decided to make use of them in another dumpling application. Of course, I immediately had to top up my wonton wrappers and had to buy two extra packets, given that I was making dumplings for our family. Yes, we are a family of big eaters and I have a tendency to make too much food. I've experimented with the Scarcity Principle a few years back for a couple of gatherings. We still implement it judiciously, on key occasions, but it seems like I can't quite use it when it comes to dumplings. For this dumpling excursion, I bought 6 pounds of ground pork. 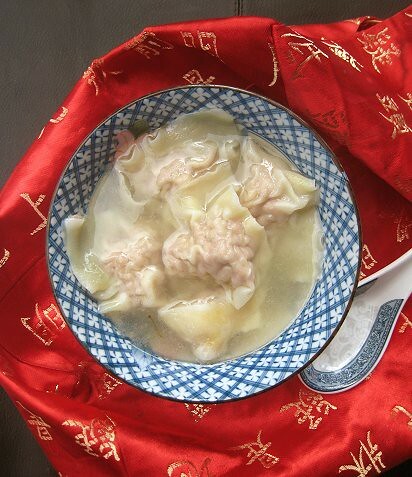 I also bought a couple of stewing chickens (called "old chicken" in Chinese) as I wanted to make a version of these "crossed hands/arms" dumplings in broth. Of course, I also had to make my personal favourite, dumplings swimming in Sichuan chili oil, topped with an explosion of ground roasted Sichuan peppercorns. I looked at Fuschia Dunlop's "crossed hands" filling recipe and it is a straightforward one, just pork with seasonings (the usual suspects, soy sauce, Shaoxing wine, pepper). All the better, since TS is not a big fan of the pork + cabbage combination (as seen in our post about CSC's Shanghai Potstickers and Faux Siu Mai) when it comes to meat fillings. One concession I made to Fuchsia's recipe was making this "ginger water". 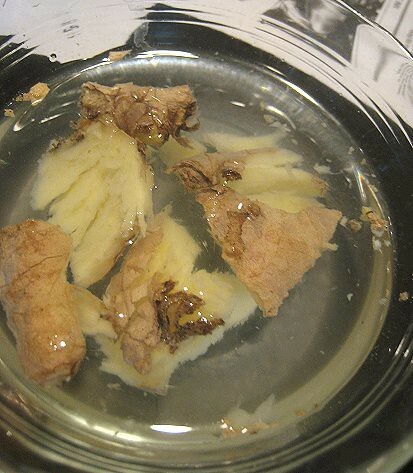 I crushed some ginger and let it steep in cold water. Then, it was a matter of mixing the meat with seasonings and pouring the ginger water slowly into the mixture to incorporate. 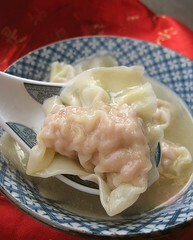 We filled these dumplings like tortellini: drop meat filling onto wrapper, fold into triangle, let two tips meet. I assume the "crossed hands/arms" name comes from the way the wrapper tips come together in the middle like so. We boiled the dumplings in a pot of water and set them aside. They look so brainy! Adorably brainy. I used the "old chicken" to make a broth, then simply ladled heated chicken broth over the dumplings. Kinda plain Jane, isn't it? To jazz it up, I'm thinking one can add some mushrooms (wood ear mushrooms would be nice for textural contrast, while shiitakes would add a deeper, woodsy flavour to everything), but we decided to eat them as is. I suppose we could have also added some chopped green onions on top for extra flavour and color, but I was in a hurry to get to the chili oil version. For my personal favourite, I roasted some Sichuan peppercorns in a dry pan until fragrant. Then, I ground them up, quite coarsely as you will see, but you can ground them up finer if you wish. 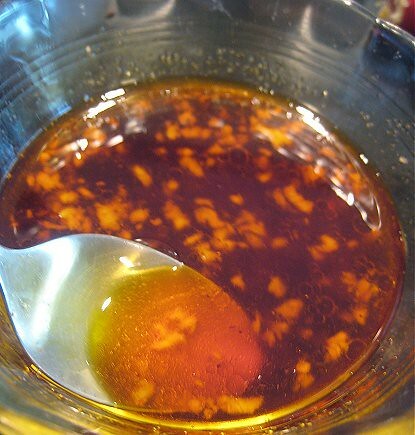 To make the chili oil sauce, I took some Red Chile Oil 紅油 (how to make red chile oil), added some chicken broth to thin it, added soy sauce or salt (or a combination of both), and some sugar to taste. Sprinkle some of the ground roasted Sichuan peppercorns and everything's all right with the world. What a handsome pair of dumplings they make! Crush the ginger with the flat side of a cleaver or heavy object and leave to soak for a few minutes in 1/2 cup cold water. Place ground pork in a bowl and add the beaten egg, Shaoxing wine, ginger-soaking water (pieces discarded), sesame oil, salt and pepper. Mix well, using your hand to stir the stuffing in one direction, then add the stock in several stages, making sure each batch has been fully absorbed by the meat before you continue. 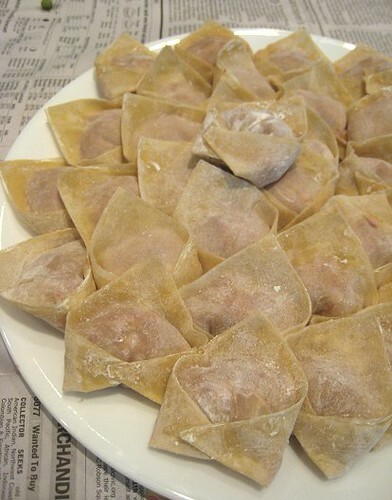 For each wonton wrapper, drop a teaspoon or so of meat filling and fold the wrapper diagonally to form a triangle. You may need to moisten the edges to seal the wrapper. Then, take the right and left tips of the triangle and seal them together. Lay the wrapped wontons out, separately, on a lightly-floured tray. Bring a generous pot of water to boil. 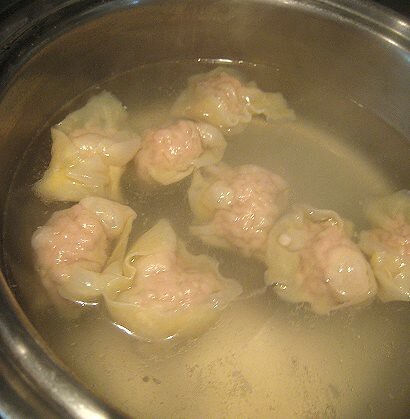 In batches, drop in some dumplings into the boiling water and boil/simmer until dumplings are cooked through. Scoop out and drain. 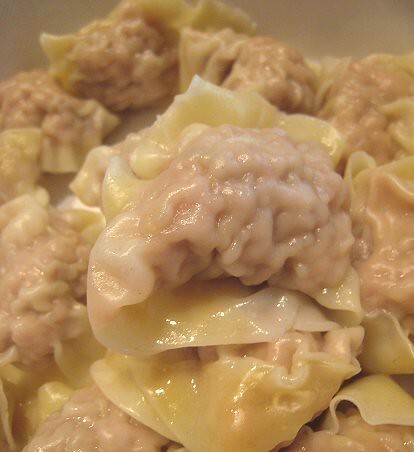 You may want to lightly toss cooked dumplings in oil to prevent sticking. Heat chicken or pork stock. Add sliced mushrooms (if using) and cook until done. Keep broth hot. Place desired number of cooked dumplings in large serving bowl or in individual bowls and ladle hot stock (and mushrooms) over. Garnish with chopped green onions, if desired. 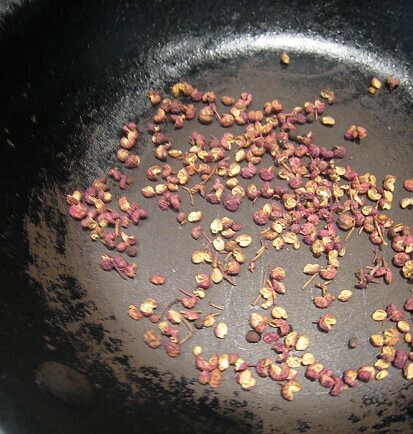 In a dry pan, toast Sichuan peppercorns until fragrant. Grind coarsely. In a bowl, mix together red chile oil, light soy sauce, sugar and stock. Add crushed garlic and Sichuan peppercorn chili oil to taste, if using. 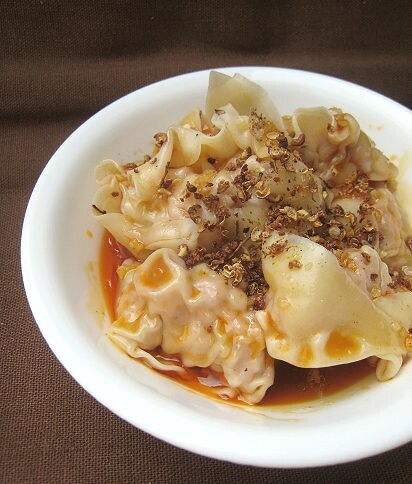 Spoon sauce over cooked dumplings and top with ground Sichuan peppercorns. I'll take one of each. I bought some ground pork to make dumplings too, but not 6 pounds! Only 1 pound. I used 1/4 pound for porridge and was thinking of dividing the rest for meatballs and dumplings. Hi girls! It's so nice to see you again. I'm sorry I've been absent, but my new life in the big city has been C R A Z Y! 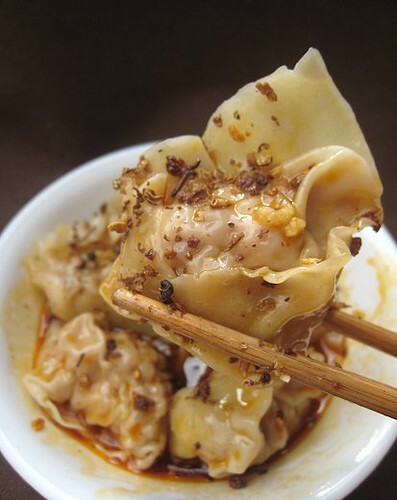 As always, you amaze me with your Asian recipes and this dumplings look so delicious (and not extremely complicated to make, he)Keep up the great work! 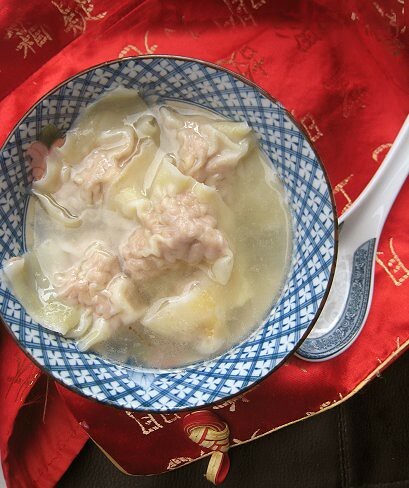 Dumplings epitomizes Chinese culture to me,so refined and so eternal. 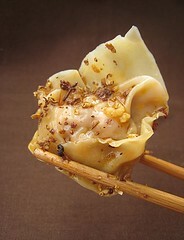 Love the restrained use of spices here and the shape and filling of these dumplings. This looks incredible. I love both ways that you have done this, especially the one with thechilli oil. Super! oo yes, yummy brainy little things! I love chili sauce on dumplings. This looks delicious! I think for us, 1 pound is for 1 person. Teehee. We are quite excited to hear more and more and more about you and Mexico! We have been quite delinquent in blogging as well, I must say. I'm only getting to comments made in June! I think I'm going to second (or is it "third") the motion as well; I think the chili oil is my favorite too.